president, Obasanjo today on Instagram. back to Lagos see who is sitting next to me legendary "Pres. Olusegun Obasanjo".... immediately initiated him to the #neversaynevergang." 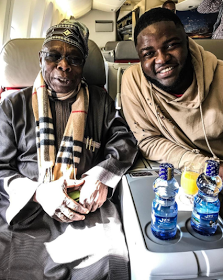 0 Response to "Skales Takes A Photo With Obasanjo On A Plane From Addis Ababa To Lagos"